Is Blue Jeans or Denim Environmentally Friendly? 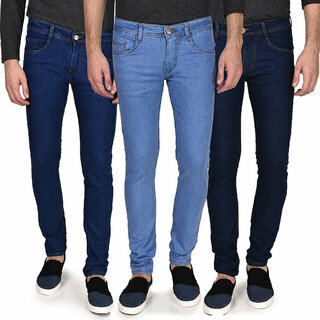 Denim, especially blue jeans, is the biggest single textile product type sold around the world. This is because of its popularity in all geographic regions, social strata and age groups. The production chain is optimized for bulk production and with the capacity to meet this global demand. This means that the overall environmental impact of denimor blue jeans manufacture is significant. Improvements in each step of denimor blue jeans production offer potentially significant reductions in overall environmental impact as well as cost saving for the industry. The first stage is critical in establishing the boundaries of the LCA, for example whether the study includes all production, distribution and use stages for the product from ‘cradle to grave’, including how finished products are used and then disposed of by consumers. Inventory analysis includes categories such as energy requirements, raw material needs, emissions (to air, water and land) and waste related to production of raw material and finished products. Life cycle impact assessment evaluates the potential environmental impacts of a product throughout its life, whilst interpretation identifies the most significant types of impact and makes recommendations for improvement. Contribution to climate change: Quantifies amount of greenhouse gas emissions. Energy use: Quantifies how much energy is used in production. Renewable energy use: Percentage of energy use from renewable sources. Water consumption: Measures water usage in cubic meters. Land occupation: Amount of land needed to produce a product. Qualified sustainably grown fiber content: A content analysis of fibers grown under a recognized cultivation program to address areas of sustainability. Waste generation: Surveys the primary solid waste content during production and finishing. Materials efficiency: How much of the primary materials end up in the final product. Recycled content: Assesses the amount of materials used from post-consumer recycled sources. Land transformation: Amount of land transformed from its original state by production. Eutrophication: Measures the impact of harmful nutrients discharged to freshwater bodies. Cotton production (including growing and harvesting). Warp yarn dyeing (including dyestuff and auxiliaries production and use). Sizing (including size production and use). Garment washing/finishing (including the production anduse of chemicals, auxiliaries, enzymes, etc.). Retail (marketing, logistics/distribution, sales outlets). Use by consumers (including laundering). End of life (disposal or recycling/reuse).